Currently Reading: Walking the Labyrinth by Lisa Goldstein, a review book, and The Sparrow by Mary Doria Russell, which I’m reading for the Sword and Laser bookclub. Finished: Tommy Black and the Staff of Light by Jake Kerr, Onyx Webb by Richard Fenton and Andrea Waltz, and The Kingdom Lights by Steven V.S. I will be reviewing all of these over the next week. DNF: Feast of Fates by Christian A. Brown. I’ll post a DNF review next week. Winter 2014-2015 COYER Progress: I’ve read 5 books towards my goal of 10, and participated in 1 read-a-thon towards my goal of 3. I’ve also participated in some socializing on Facebook, but I need to check out some reviews and do a mini-challenge. 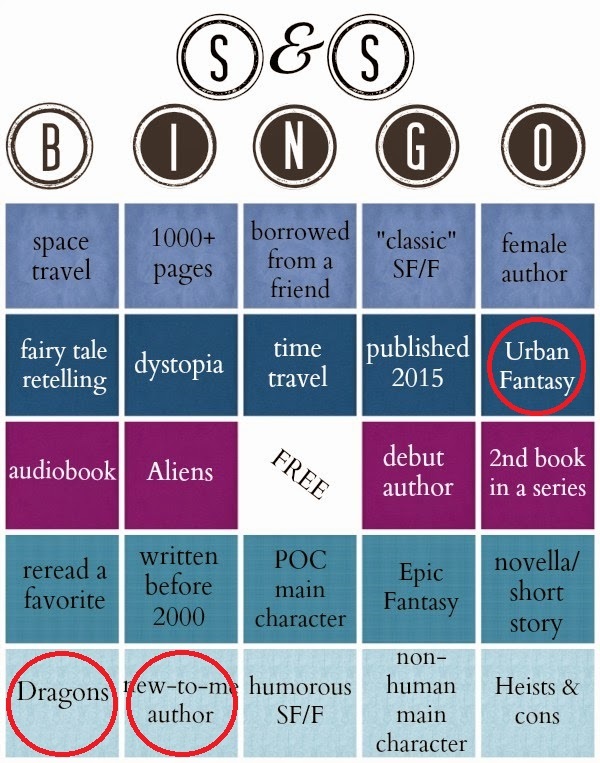 SF/F Bingo: I may end up moving these around a bit, but so far I’ve read a book containing dragons (The Sunken by S.C. Green), a book written by a new-to-me author (Tommy Black and the Staff of Light), and an Urban Fantasy (The Kingdom Lights). Total number of books for the year: 5. Top Commenters: This week, my Top Commenter was Shaina from Shaina Reads. Tied for 2nd and 3rd were Terri M., The Director from Second Run Reviews and thebookmagpie from The Book Magpie’s Nest.